Safety and health standards are highly regulated by the federal Mine Safety and Health Administration (MSHA) and the Kentucky Office of Mine Safety & Licensing (KOMSL). All surface and underground mines are inspected regularly. Larger mines may have inspectors at the mine site every day. New miners must have 24 hours of training and pass a written exam before being eligible for employment at a surface mine. Workers at prep plants, rail sidings, and river terminals must also meet those training requirements. The inexperienced miner must work a minimum of 45 days at a surface mine before becoming a certified experienced miner. After the initial training, each surface mine employee is required to receive 8 hours of annual retraining. To obtain a Surface Mine Foreman Certification, a miner must have 3 years of surface mining experience achieved after age 18. To obtain certification, a surface mine foreman must specialize in either coal extraction or post mining activities (coal preparation or coal handling). The applicant must have at least one year of practical experience in the specialty category. 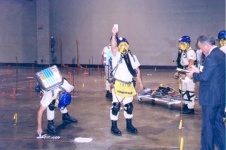 To become a blaster in a surface coal mine, the applicant must attend 30 hours of training and pass both a licensing test and a certification test. Two years of additional work experience under a licensed blaster is also required. New miners are required to have a minimum of 40 hours of training plus pass a written exam prior to starting work as an inexperienced miner. An inexperienced miner must work a minimum of 45 days in an underground mine before becoming a certified experienced miner. A minimum of 16 hours of annual retraining is required to maintain the miner certification and continue to work at an underground mine. A newly hired miner (experienced or inexperienced) also must receive up to 8 hours of mine site-specific training. *Test are required in addition to years of experience. Note: Over 20,000 persons are trained or retrained annually for one or more surface and/or underground miner classification by the KOMSL to maintain the current Kentucky miner workforce of over 15,000 miners. Source: Kentucky Office of Mine Safety & Licensing (KOMSL). To receive an Underground Mine Foreman Certification, a miner must have five years practical underground coal mining experience gained after age 18, with at least one year on an active working section of a coal mine. An Assistant Mine Foreman Certification requires three years practical experience. Each miner receives new work assignment training (Task Training) to become certified for each new job classification. To maintain their certification, and qualifications, certified electrical workers must satisfactorily complete annual electrical classes. Only certified shot-firers can detonate explosives within a mine. MET/EMT - A Mine Emergency Technician (MET) or Emergency Medical Technician (EMT) is required at every coal mine on every shift with a work force of 50 or fewer employees. An additional MET or EMT must be employed for each additional 50 employees, or any portion thereof. METs are certified through training and examination administered by KOMSL under regulations established by the KOMSL. The MET certification requires 40 hours of initial training, plus a current CPR certification and eight hours of annual retraining. All certifications and mining specialties, as established by the Kentucky Mining Board, must be signed by the Director (KOSML) verifying the holder has completed the requirements for certification.